Convert MTS to MP4, MOV, AVI and other video formats on Windows/Mac. Crop, trim, rotate MTS videos and apply effects, add watermarks on it. Compress MTS video size smaller without losing any quality. Add MTS videos from devices directly and transfer converted MP4 to iPhone/Android phones easily. Nowadays, lots of people prefer to shot some awesome video clips for their trips, parties, etc, to memorize the happiness. However, most of the AVCHD video clips are in MTS format which is usually encrypted. You can't directly play them in iPod, iPhone, or some other mobile players until you convert MTS to MP4. This article will provide you the best MTS to MP4 video converter for Windows/Mac the easiest way to convert MTS to MP4 online step by step, so that you can simply convert your MTS to MP4, a commonly-used video format for almost any devices, and then play your MTS videos without any trouble. To convert MTS files to MP4 files, all you need is to get a professional MTS to MP4 converter like Wondershare UniConverter (originally Wondershare Video Converter Ultimate). It supports over 1000 video and audio formats for conversion including MTS, MP4, MOV, AVI, MKV, WMV, etc. You can edit your MTS files before conversion with trimming and cropping unwanted parts, adding watermarks, applying effects, and more others. Compressing MTS video size without losing quality is also allowed here which will help you save much space for your devices. This all-in-one MTS to MP4 converter also has additional functions like video downloading, DVD burning, video transferring, etc. Convert MTS to MP4, AVI, MKV, MOV and other 1000+ formats on Windows/Mac. Compress MTS video size without losing any quality. Burn MTS videos to DVD and play on your DVD player with free menu templates. Optimized conversion presets for iDVD, iMovie, Final Cut. Edit MTS videos with advanced video editing features including trim, crop, apply effect, add subtitle. 30X faster converting speed than any other common video converter. All-in-one video converter with functions of downloading YouTube videos, recording screen, transferring videos to mobile phones, etc. 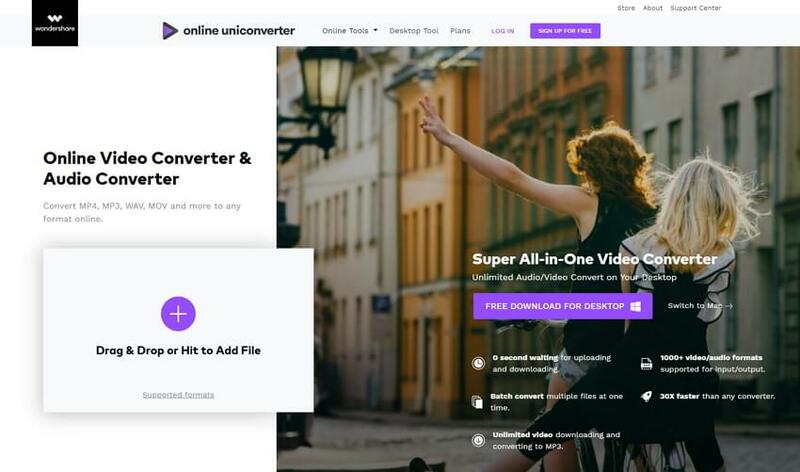 Before starting the conversion process, you need to download and install Wondershare UniConverter (originally Wondershare Video Converter Ultimate) on your PC/Mac first. It's free to download and easy for installing, just choose your right version below and follow the simple steps listed no matter on Windows or Mac. Step 1 Add MTS videos to Wondershare MTS to MP4 converter. Launch Wondershare UniConverter and click the Add Files button to add your MTS video files, or you can directly drag & drop the MTS files to software interface. Multiple files can be added here for batch conversion. If you need, you can edit your MTS videos by clicking the editing buttons under the thumbnail of the imported video. 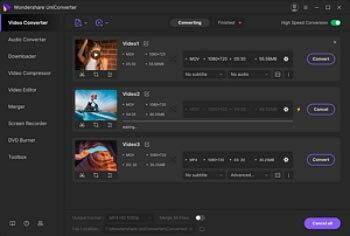 You can trim, crop, add effects, watermarks and subtitles to your videos. Trim: Drag the two sliders to select the segment you want, and then click the scissor icon and the OK button. In this way, you can cut off any clip you don't want. Step 3 Set the output format as MP4. 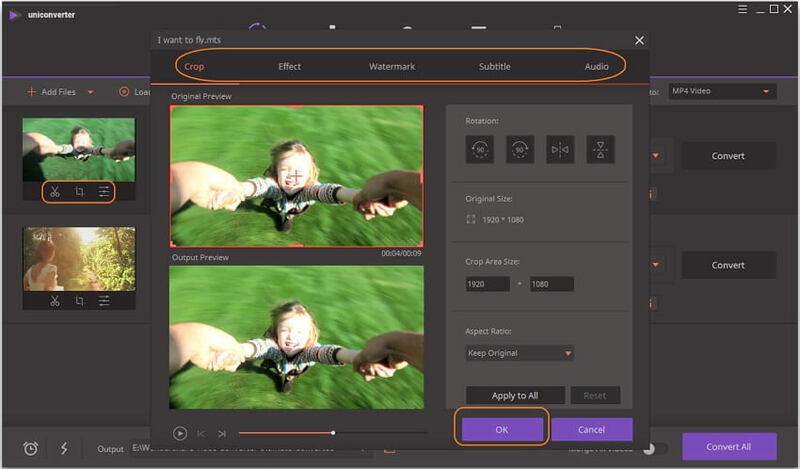 Click the down-arrow button beside the Convert all files to: option, then select the Video tab to choose the MP4 in the left sidebar and select the video resolution from the right section. Step 4 Convert MTS to MP4 easily. After all settings have be done, click on the Convert All button to start converting MTS to MP4 with zero quality loss on Windows/Mac. Get the converted MP4 files from the Converted tab, and you can transfer these MP4 videos to your iPhone/iPad/Android devices by clicking on the Add to Transfer button. If you want to find a way to convert MTS videos to MP4 for free, then you can move to Top 5 MTS Converters for Windows/Mac >> to learn more. 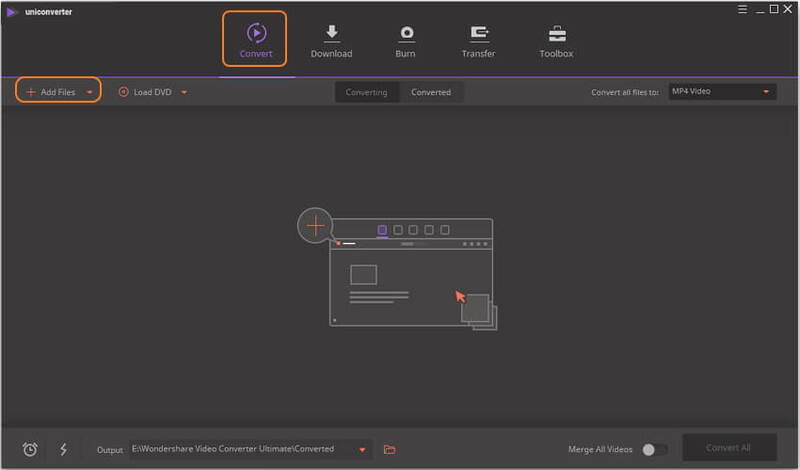 Step 1: Open Online UniConverter (originally Media.io) (https://www.media.io/) on your PC/Mac browser, click the Drag & Drop or Hit to Add File button on the interface to input your MTS files. 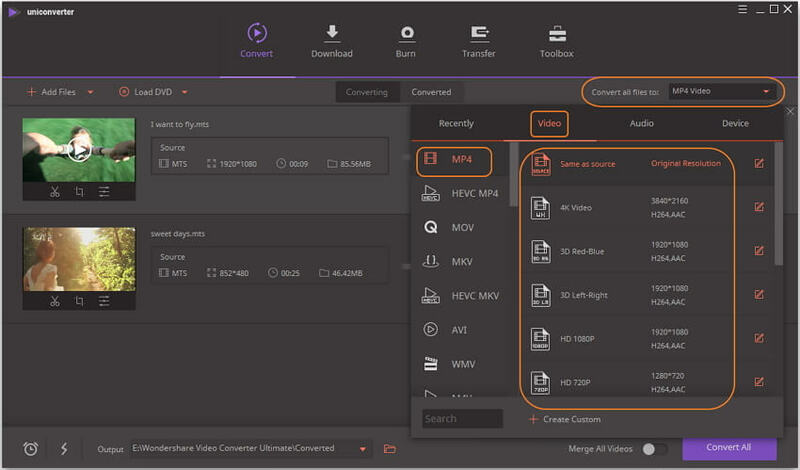 Step 2: Next, choose the MP4 as your output video format from the Video category, which is in the drop-down list next to the Convert all files to: option. Step 3: Click on the CONVERT button to convert MTS to MP4 online and free. You're allowed to download the converted MP4 files or save to Dropbox. 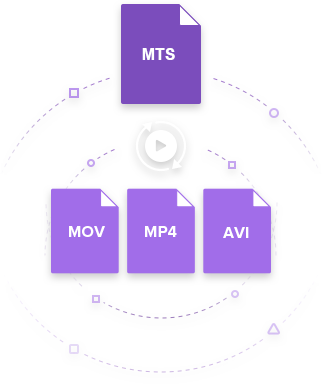 MTS is a high-definition MPEG, AVC, H.264 video format. It is for digital camera recorders or Advanced Video Codec High Definition (avchd). It is often used by Sony, Canon, Panasonic, etc. MP4 is a container format used to store video, audio, and subtitles data. Since stores like iTunes uses this container format, it is used with iPod and PlayStation (PSP). It becomes a popular format.